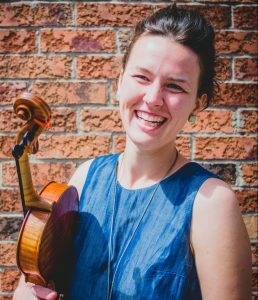 Lea Kirstein (www.leakirstein.com) is a violin, viola, cello and bass player based in Toronto, Ontario. She holds a BMus specializing in music education and classical viola performance from the University of Victoria. Her teachers include: Joanna Hood (Lafayette Quartet, Sir Paul McCartney), Janos Sandor, Darol Anger, Natalie Haas, Jeremy Kittel and more. She showcases her diverse range of playing styles in several new music groups: 6-pc R&B band Reenie and the Goodfellas, Counterpoint orchestra, and as a freelance artist in the Toronto music scene. She has toured the US and Canada as the violist of the Boston-based Folk Arts Quartet, folk chamber ensemble based out of Berklee College of Music. She has recorded with JUNO award winner Oliver Schroer and JUNO nominee Teresa Doyle, on CDs and music videos with several independent rock bands, and electric cello with the Hypatia Creative Women’s Jazz Orchestra. Her workshop for accompanying traditional Celtic music, called “Chops and Grooves for Bowed Strings” was nominated Best Of at the Vancouver CelticFest 2012. Her passion for new music and education was combined in the Victoria portion of the National Youth Fiddle Project, the “Twisted String”, which she co-led. It is the innovative pedagogical and performance brainchild of fiddler and composer Oliver Schroer. With the Twisted String, Lea has performed on National CBC Radio Broadcasts, in folk festivals, clubs, and stages in Toronto and Vancouver, and led educational workshops in Arts Schools in Toronto. She has even been spotted instigating a “Random Act of Violins” or two in the Toronto subways! With her classical roots and love for eclectic new music, Lea is convinced that on string instruments, anything is possible.